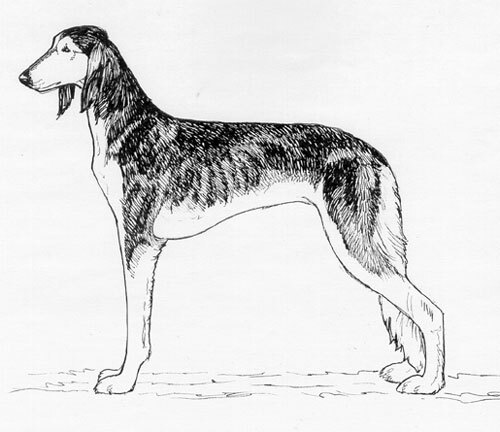 The Saluki is one of the oldest known breeds and has existed for thousands of years. It was originally bred and owned by Arab tribesmen, who used its sighthound abilities for hunting. Considered a sacred gift from God, Salukis were never sold but given as an honored gift. 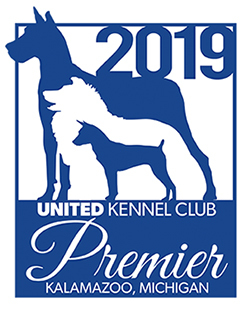 The Saluki was recognized by the United Kennel Club in 1956. The overall appearance and impression of the Saluki is one of grace and symmetry, along with great speed and endurance coupled with strength and activity. Salukis vary in type and this variation is typical of the breed due to the immense size of the Middle East area where the breed has been used for hunting for thousands of years. Each tribe had Salukis that were best suited for hunting the particular game in their region, and it follows that the dogs that were presented to Europeans and brought to Europe were from a wide variety of terrain and climate, and therefore vary accordingly. The Saluki is dignified, intelligent and independent. They are reserved with strangers, but never shy or aggressive. The head is long and narrow, and has the look of nobility. The skull is moderately wide between the ears and not domed. The stop is not pronounced. The jaws are long and strong. The bright, oval-shaped eyes are large, but not prominent. In color, they are dark to hazel. The expression is dignified and gentle with faithful, far seeing eyes. Nose pigment is black or liver. The long, mobile ears hang close to the skull. They are covered with long, silky hair. The long neck is well muscled and supple. The sloping shoulders are well laid back. They are well muscled, but not coarse. The upper arms are approximately the same length as the shoulder blades and form a good angle with them. The forelegs are straight and long from the elbow to the wrist (carpus). The pasterns are strong and flexible with a slight slope. In proportion, the Saluki is approximately square when measured from the point of the shoulders to the point of the buttocks, and the top of the withers to the ground. The chest is deep, long and moderately narrow. The ribs are moderately sprung. The back is fairly broad, and the loin is well muscled and slightly arched. The hipbones are set wide apart. The underline is well tucked up. The hindquarters are strong, showing galloping and jumping power. The upper and lower thighs are well developed. The stifle is moderately bent. The hocks are low to the ground. The strong, supple feet are well feathered between the toes. The feet are of moderate length, not cat footed; with long, well-arched toes. The long tail is set on low and is carried naturally in a curve. It reaches at least to the hock. It is well feathered with long, silky hair on the underside; not bushy. In adults, the tail is not carried above the line of the back, except in play. The coat is smooth and has a soft, silky texture. There is feathering on the backs of the front legs and on the rear of the thighs. In adults, there may be feathering on the throat. Puppies may have a slightly woolly feathering on the thighs and shoulders. The smooth coated variety has no feathering. Any color or combination of colors is permissible, with the exception of brindles, which are undesirable. Dogs average in height from 23 to 28 inches. It is breed typical that females may be considerably smaller.